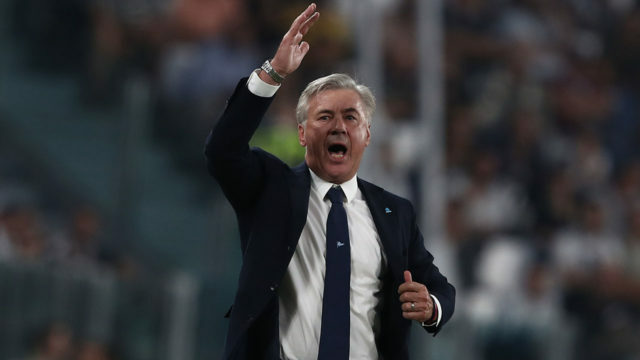 Carlo Ancelotti criticised his Napoli side after they warmed up for Wednesday’s Champions League visit of Liverpool with a 3-1 defeat to title rivals Juventus in Serie A. They took the lead through Dries Mertens but Mario Mandzukic nodded Juve level and then added another early in the second half. Napoli’s hopes were effectively dashed when Mario Rui was sent off for a second booking and Leonardo Bonucci completed the scoring. 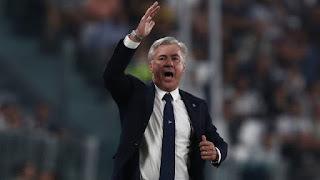 “I was angry with my team because we started strong and took the lead, but then started getting sluggish and allowed Juventus to regain their confidence,” Ancelotti said. “I think the referee made a superficial decision. Mario Rui got the second yellow card after a good long wait to consider it. The two yellows came from the superficiality of the referee. “A defeat can happen, just as Juventus can lose in Naples. Liverpool fly to Naples tomorrow to prepare for Wednesday’s showdown at the Stadio San Paolo. The Reds drew 0-0 on their only previous visit in the Europa League in October 2010.